We’re proud to announce that Dr. Eugenie Brunner, our double board certified facial plastic surgeon, has been selected as a 2016 “Top Doctor” in the New York Metro Area. Many patients report that finding a qualified and caring facial plastic surgeon is a top priority. Castle Connolly seeks to make the search easier by offering a reliable resource to identify the best doctors in each field. 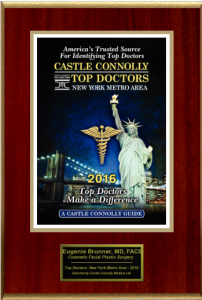 Utilizing a rigorous peer-review process, Castle Connolly selects a number of elite physicians per geographic area to receive its “Top Doctor” awards each year. “Top Doctor” candidates are nominated by their peers. After the initial selection, they must go through a meticulous review process that considers their educational background, training, hospital appointments, disciplinary histories, and several other factors. Doctors cannot pay to receive recognition as a “Top Doctor;” the title is bestowed upon the nominees who have shown a commitment to exceptional patient care. Dr. Brunner is honored to be chosen as a “Top Doctor.” This is the seventh year that she has been selected for this accolade, and she looks forward to continuing to provide the unsurpassed cosmetic care her patients have come to expect. She maintains a state-of-the-art practice with a comprehensive array of surgical, non-surgical, and laser rejuvenation treatments for the face and skin. In addition to the “Top Doctor” distinction, Dr. Brunner has received the Patients’ Choice Award two years in a row.